Christophe Coenraets here demonstrates execution of the employee database application developed in Flex, on three devices viz – Android phone, Samsung Tab and the Playbook tablet. This was one of the exciting announcements made today at Adobe Max. It has been known for quite sometime that Adobe has been working on optimizing Flex Framework for mobile development. Flash Builder Burrito does exactly that. You can code mobile application (as of now – in the context of Google Android devices) and publish them as AIR apps. 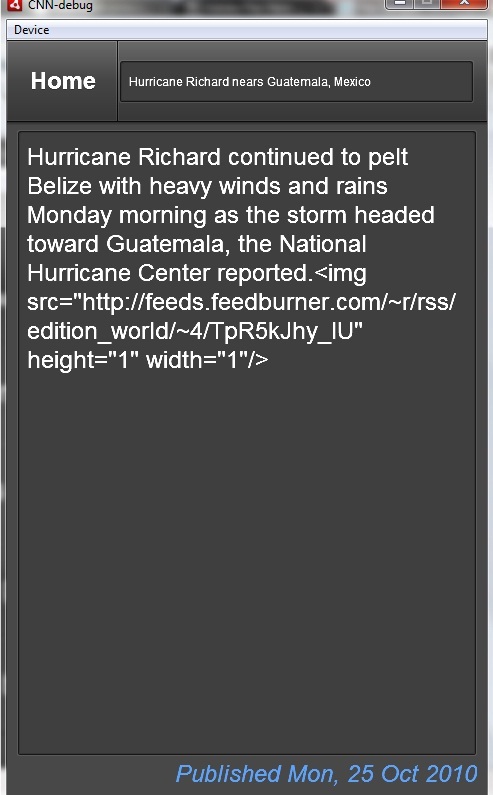 Excited about this, I started to write a simple data-centric RSS feed reader application. Flash Builder Burrito is a separate SDK that you need to download from Adobe Labs, and is currently in Preview. You strongly feel that you are designing in a mobile context. And as I said, for the Android phones. You can listen to events such as press of MENU and BACK buttons. You can include transitions between views. 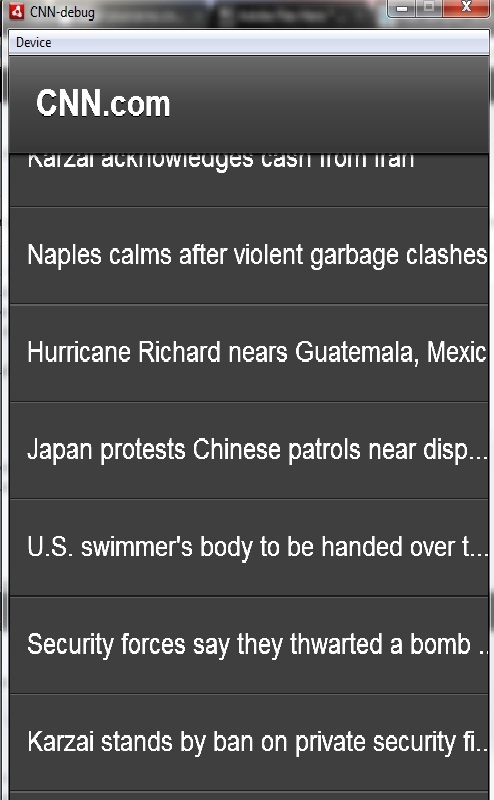 The action bar (that is the top pane of the application) is customizable. You can add icons/buttons to them. Quick integration with data services. I have always believed projects written in Flex/Flash Builders are handy when dealing with data-driven applications. Connecting to webservices is as simple as they are in Flex (for the desktop). Obviously, from the above images, you’ll observe the img HTML tags. Yes, I am figuring out a way to display RichText inside Spark TextArea. Also, being a aesthetically challenged programmer, I haven’t thought even a single second to skin my app or its components and hence apologize for the UX. I am still in the process of skinning this application and shall soon test/deploy it on a compatible Android device ( I done have one; If any of you have pls comment below, I shall send it to you, for your comments and feedback) after completion. But I must say, I finished this whole RSS reader application within half an hour (inclusive of reading basic Burrito docs). So, I call super-fast application development environment. A Few Noteworthy Stats ! Here are a few noteworthy statistics that can help you in decision making. Very soon Flash will be present in iPhone and more Android devices will host Flash Player 10. So, if you are wondering what your target device should be, who the audience would be and how much you can earn form the application, then go through this presentation made by Scott. It covers topics involving the Apple iPhone 3.0 and the Android 1.5 overviews along with the major highlight – Statistics of the different platforms and how they are performing.The presentation also holds key information on the app stores of each platform and what they offer to the developer including the initial and running costs. the iPhone apps are the most cooking ones and iPhone developers are reaching a pool of 15M customers worldwide. Symbian continues to be the enjoying the richest customer base with approx 50M devices worldwide. Its appstore – Ovi has only recently been launched but has been making brisk sales. Remember, Nokia dominates the smartphone category with a share of approx 40%.